Industrial process temperature maintenance cables and controls are available for a variety of applications. By selecting the proper heat-tracing cable and controls, the process temperature maintenance system can manage the temperature of fluid in a pipe maintaining it to a desired level, ranging from low to high, depending on the need dictated by the particular process. 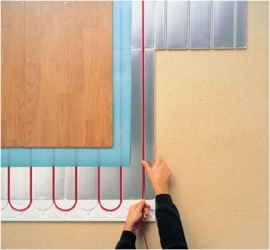 Electric underfloor heating is installed close to the floor surface resulting in a quick warm up of the room. Thanks to the uniform heat distribution across the floor, it is possible to set the thermostat 2 degrees lower than usual, without any loss of comfort or warmth. It is an excellent system to provide complete room heating or to compliment the existing heating system. Today's hot water system requirements focus on users' comfort as well as operational and energy savings. With this in mind, the Raychem HWAT System keeps the hot water at the right temperature everywhere in the building while saving energy at the same time.